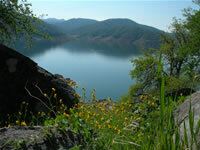 See the Pine Flat Lake website for additional information. Primary recreational opportunities are listed below. Directions: 35 miles east of Fresno. Take Belmont east, Belmont becomes Trimmer Springs Road. Lake is approx. 3 miles past the town of Piedra on Trimmer Springs Road. To get to the Park Headquarters and the Pine Flat Dam turn right on Pine Flat Road from Trimmer Springs Road in Piedra. Factoid: Less than an hour east of Fresno in the Sierra and Sequoia National Forests. The scenic and rugged Kings River Canyon is the location of this beautiful park where fishing, boating, and waterskiing are all available.